When the kids leave home it may take a while but one day you wake up and say.... I sure would like to have an extra guest room. For me it took a few years... 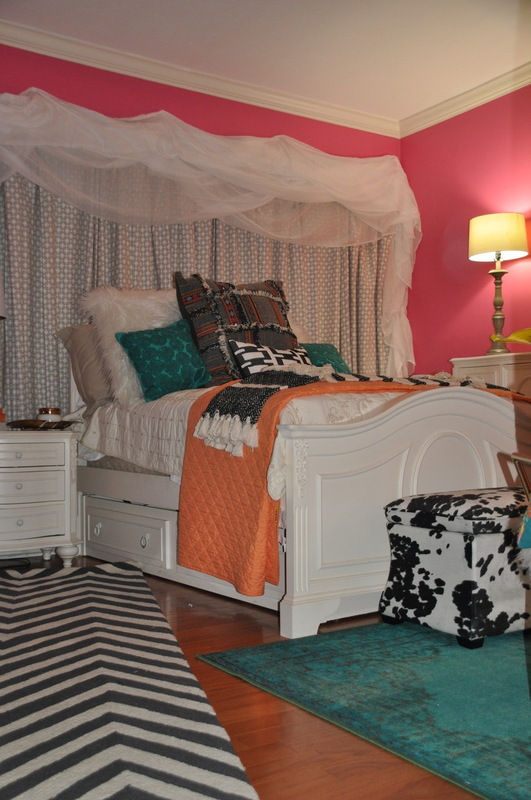 I still loved the Barbie pink room that my little Elle Woods used to love so much. I actually decided I couldn't part with the pink. That was going to be a challenge I thought. My friend Joyce Street suggested we first move the furniture, This is where you should always start and guess what it is costs nothing. The next step is a neutral color bed spread. You can get them on sale anywhere. This one I found for $27. Pillows can be a very inexpensive way to add color and texture. I never throw away a pillow. You can mix in some you already have. Black and white always mix in with almost any color. Curtains in a neutral also can be found on sale. Fabric can be added to the top and sides or your curtains to create drama. Don't be afraid to mix prints with accessories. Instead of one big mirror I found these 2 small mirrors. It was cheaper to do two. I love to do more than one rug in a room. I found these for 70% off. I do believe in artwork and that is where I spend. The two shown here are from Joyce Street and Noel Webb. Good art makes the whole room look expensive. I bought very basic lamps for now. ( I will want to replace them later on but for now they will do) I love to add something very trendy like this fur pillow chair. Since we kept the old furniture it was in the budget. My favorite thing we did was to take off those ugly closet doors and replace them with curtains (Walmart $7). This entire makeover was done for under $2,500. I tested it out this past weekend with a house full of friends. It was so nice to have more room for company.And when my all grown up little Elle Woods comes home to visit she will still have her pink room.